In previous posts, we’ve taken a look at 16 of Pennsylvania’s 24 wind farms. Now let’s finish off the tour by examining the eight newest wind farms that have been started by renewable energy development in the Keystone State. About 4,000 acres of land in Logan Township are home to the Chestnut Flats Wind Farm. Located northwest of Altoona, the site consists of 18 wind turbines, which generate 38 MW of renewable energy at maximum capacity. When the site became operational in 2011, Delmarva Power & Light Company signed a 20-year contract for the purchase of the carbon-free power produced at the facility, which it places on the electric grid and delivers to its customers. The South Chestnut Wind Power Project has the capacity to generate 46 MW of energy with 23 wind turbines. The site, which opened in 2011, is located in Fayette Country. The wind energy generated at South Chestnut is sold to Just Energy and Hudson Energy, leading competitive retail suppliers in Pennsylvania. Residents or businesses in the area that choose green energy from one of these suppliers essentially purchase a supply of wind energy from the South Chestnut facility. In early 2012, the Highland North Wind Farm launched with 32 wind turbines capable of generating 2.5 MW of renewable energy each. Altogether these wind turbines can generate about 75 MW of electricity – enough to power 18,000 homes. According to the owner, EverPower, the facility will offset 126,700 tons of carbon emissions every year. The Sandy Ridge Wind Farm is located in Taylor Township in Centre County, where it became operational in 2012. The facility has 25 turbines capable of producing 2 MW of renewable wind energy each. When all of these turbines are spinning at their maximum capacity, the Sandy Ridge Wind Farm can generate 50 MW of energy. Somerset County has more wind farms than any other county in Pennsylvania, including its latest addition, the Twin Ridges Wind Farm. Launching in 2012, Twin Ridges has a total of 68 wind turbines at 2.05 MW a pop. In total, the facility can generate 139.4 MW of wind energy – enough to power 34,000 homes and offset 235,500 tons of carbon emissions every year. As one of the latest additions to the Pennsylvania wind energy scene, the Laurel Hill Wind Energy Project became operational in 2012. The facility consists of 30 wind turbines which stretch seven miles along Laurel Hill Ridge in Lycoming County. At 424 feet tall, these turbines capture winds high above the ground, allowing them to generate a total of 69 MW of clean, renewable wind energy. The power produced at this site doesn’t stay in Pennsylvania; instead it’s is sold to Delaware Municipal Electric Corp., under a 25-year purchase agreement. 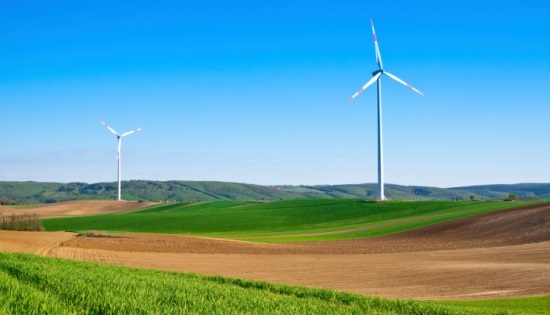 Located in North Cambria County, the Patton Wind Farm sits on active farm land. The facility became fully operational in 2012 with 15 wind turbines that generate 2 MW each. With ideal strong windy conditions the Patton Wind Farm can generate 30 MW of renewable electricity. Once placed on the power grid, the carbon-free energy from the facility can power 7,500 homes annually. The newest – and the largest – wind generation facility in Pennsylvania is the Mehoopany Wind Farm. The facility, which just began operations in December 2012, spans 9,000 acres in Wyoming County, about 20 miles northwest of Scranton. The Mehoopany Wind Farm has 88 wind turbines that tower 328 feet above the ground. Collectively these turbines can generate 140.8 MW of renewable wind energy. Old Dominion Electric Cooperative has signed a power purchase agreement to buy 75 MW of the wind farm’s power. An additional 30 MW has been purchased by Southern Maryland Electric Cooperative and the rest is still up for sale.